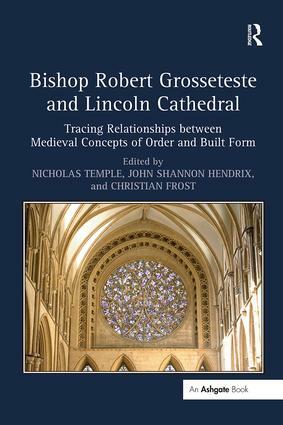 Bishop Robert Grosseteste and Lincoln Cathedral is an in-depth investigation of Grosseteste’s relationship to the medieval cathedral at Lincoln and the surrounding city. This book will contribute to the understanding of Gothic architecture in early thirteenth century England - most specifically, how forms and spaces were conceived in relation to the cultural, religious and political life of the period. The architecture and topography of Lincoln Cathedral are examined in their cultural contexts, in relation to scholastic philosophy, science and cosmology, and medieval ideas about light and geometry, as highlighted in the writings of Robert Grosseteste - Bishop of Lincoln Cathedral (1235-53). At the same time the architecture of the cathedral is considered in relation to the roles of the clergy and masons; the policies of the bishop; matters of governance, worship and education; ecclesiastical hierarchy, church liturgy, politics and processionals. The book explores Grosseteste’s ideas in the broader context of medieval and Renaissance cosmologies, optics/perspective, natural philosophy and experimental science, and considers historical precedents in regard to religious, political and symbolic influences on church building. The contributors to this volume make an important contribution to our current understanding of the relation between architecture, theology, politics and society during the Middle Ages, and how religious spaces were conceived and experienced. Contents: Introduction. Part I Ritual and Liturgy: ‘The face of one making for Jerusalem’: the chapter of Lincoln during the episcopate of Robert Grosseteste, Nicholas Bennett; Light and procession: Bishop Grosseteste and the ceremony of the visitation, Nicholas Temple. Part II Philosophy of Grosseteste: Robert Grosseteste’s cosmology of light and light-metaphors: a symbolic model for a sacred space?, Cecilia Panti; Lumen de Lumine: light, God and creation in the thought of Robert Grosseteste, Jack Cunningham. Part III Architecture and Cosmology: The architecture of Lincoln cathedral and the cosmologies of Bishop Grosseteste, John Shannon Hendrix; Robert Grosseteste and the phenomenological nature of geometry and light, Noé Badillo; Robert Grosseteste and the foundations of a new cosmology, Dalibor Vesely. Part IV Comparisons and Context: Architecture, liturgy and processions: Bishop Grosseteste’s Lincoln and Bishop Poore’s Salisbury, Christian Frost; Charlemagne’s palace chapel at Aachen: apocalyptic and apotheosis, Allan Doig. Bibliography; Index. Nicholas Temple is Professor of Architecture, School of Art, Design and Architecture, University of Huddersfield, UK. John Shannon Hendrix is Professor of Architectural History, University of Lincoln, UK. Christian Frost is Oscar Naddermier Professor of Architecture, Birmingham City University, UK.